RF engineer or rf drive test engineers are commonly asked below written question. But it depends on your job duties for which postion you are hiring. 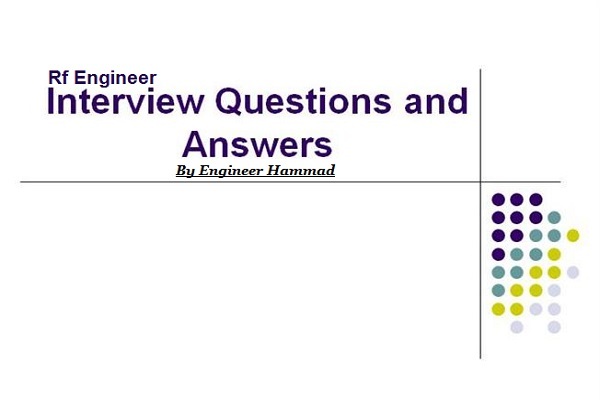 Rf engineer interview question should not be same all time due to new technologies coming day by day but basics are very important to understand. When you talk about drive test engineer jobs you should have to know companies for drive test engineers. Q.1: Please introduce the telecommunication/wireless system configuration. 0 to -6:good;-6 to -10: normal;-10 to -12:acceptance; below -12:bad. Q.3: Introduce the testing for new site. Q.4: How to estimate the antenna /feeder cross during testing? When we at the service cell coverage the rxlev is other cell’s .and the rxlev is weakly. When we test ,target cell ,the sverce line connect to other cell. Q.5: Please Analysis of Causes of call drop. Coverage hole, dead zone, isolated island, uplink/downlink unbalance Coverage over shooting Signal attenuation. Internal interference, external interference and the equipment interference ; Strong downlink/ uplink interference. Radio link timeout counter, handover, power control etc. Q.6: Please Analysis of Causes of handover failure. Q.8: Introduce the mapinfo and googlearth. ③ analysis the logfile from mapinfo. Q.9: how can analysis the logfile and make report. Check coverage,quality ,handover and Throughput and so on. Sir, can you please share more notes in pdf. 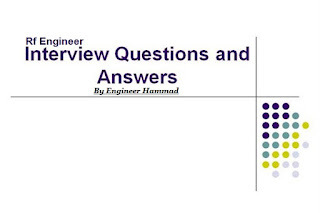 Write more about rf engineer interview questions. What if in drive testing the RF passed and the quality was good but the AF (audio) was not clear in layman's term choppy or distorted audio. Where can we find the fault?